COMPARISON OF LATERAL VS POSTERIOR APPROACH IN THE MANAGEMENT OF SUPRACONDYLAR HUMERUS FRACTURES IN CHILDREN. Fayyaz Ahmad Orfi CMH Nowshera. Objectives: To compare lateral versus posterior approach in the management of supracondylar fractures of humerus in children in terms of functional outcome. Study Design: Retrospective Comparative study. 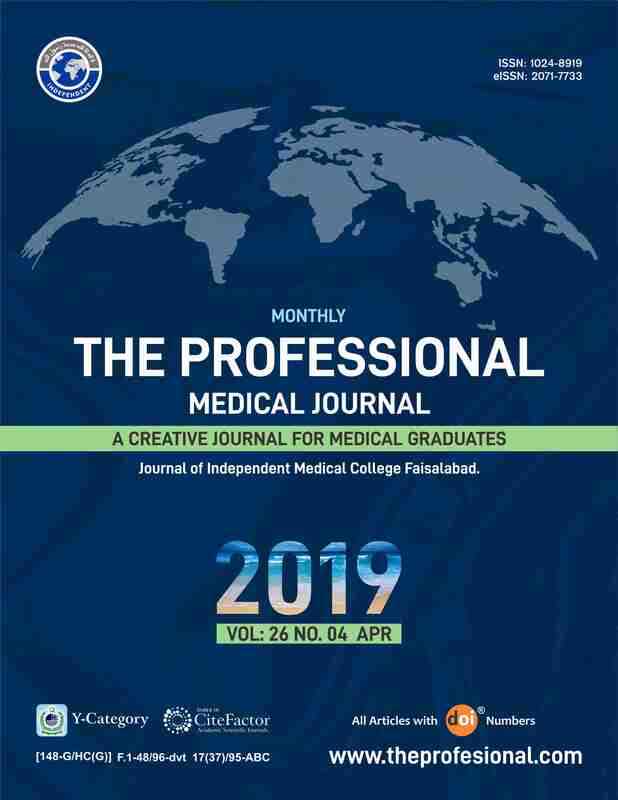 Place and Duration of Study: This retrospective study was carried out over a period of seven years from Oct 2009 to Oct 2016, at Combined Military Hospitals Kharian, Malir and Nowshera. Patients and Methods: All the children having supracondylar fracture (Gartland Type-II and III) who underwent surgical intervention either by posterior or lateral approach were included in the study. In Group-A children operated by posterior approach were placed while in Group-B children were operated by posterior approach. They were followed up in OPD after 6 months. The final functional and cosmetic outcome was assessed by using Flynn’s criteria. Data was analysed by using SPSS version -20. A p-value of less than 0.05 was considered as statistically significant. Results: A total of 104 cases were operated during this study period. Fifty-four cases were done by posterior approach (Group-A), while 50 cases were operated by lateral approach (Group-B). In Group-A the mean age was 6.1 years while in Group-B, mean age was 6.6 years. In Group-A the male to female ratio was 72:28 while in Group-B it was 64:36. The mean weight in Group-A was 19.81Kgs (SD: ±4.53) while in Group-B it was 20.44 Kgs (SD:± 3.97). The mean operative time in Group-A was 36.30 minutes (SD: ±3.32) and in Group-B it was 23.58 minutes (SD: ±2.12). The functional outcome at six months follow-up was excellent in 35 (65%), good in 8 (15%), fair in 7 (13%) and poor in 4(7%) cases in Group-A while in Group-B it was excellent in 35 (70%), good in 10 (20%), fair in 4 (8%) and poor in only one case (2%). This difference was not significant at a p-value of 0.441. Conclusion: Though lateral approach required less operative time but there was no statistically significant difference from the posterior approach comparing the functional outcome in the management of paediatric supracondylar fractures of humerus. Fayyaz Ahmad Orfi, CMH Nowshera.